When you come to the decision that your loved one needs more help during the day than you are able to offer, you need to know how to choose the right caregiver. Making this decision might sound easier than it actually is. In truth, finding someone that you trust who will provide the same level of care for your loved one that you do is challenging. 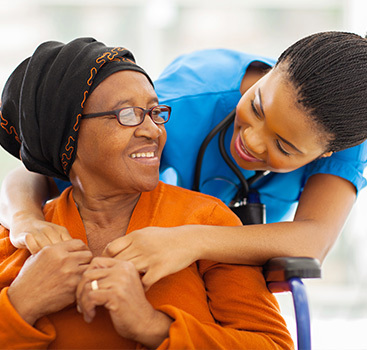 Perennial Angels Homecare knows that providing quality in-home care is an invaluable service and we can help you with the home health care and companion services that your loved one needs. Continue reading to learn what you should look for in a caregiver and then contact us to schedule your free in-home consultation. While this might sound like we’re stating the obvious, this one factor cannot be overemphasized. A good caregiver should be able to project a deep sense of selflessness and empathy for their client. Someone who works with seniors needs to display a patient spirit, as this will help the client to maintain their dignity when they are unable to perform certain functions the way they used to. As some seniors struggle with the effects of Alzheimer’s, they are even more in need of someone who understands the importance of patience and caring. A caregiver needs to have training in order to understand how to properly care for their clients. There are a number of topics such as general caregiving, senior safety, and Alzheimer’s training that will provide them with the necessary knowledge and skills to provide appropriate care in each situation. Since you will likely be meeting with potential caregivers for your loved one, you should be sure to ask them about their training and experience in this very important field of home health care. One of the best ways for you to choose a caregiver is to have them meet with both you and your loved one to have an opportunity to see how the two of them interact. You need to keep in mind that this person will be performing the functions that you would if you were home with your loved one. Be sure to ask questions that are pertinent to issues that you have caring for and then listen to the way they share how they would address that particular incident. Don’t hesitate to trust your judgement, or to include your loved one’s opinion when you are evaluating a potential caregiver. Not only do you need to feel comfortable with them being in the home and providing care, your family member also needs to feel comfortable with this person helping them through their routine each day. At Perennial Angels Homecare in Atlanta, we know that the care and wellbeing of your aging family member is of the highest importance for you. Our trained professionals have the qualities that you are looking for in a home health caregiver. Contact us today to schedule your free in-home consultation and learn about the services we can provide for your loved one.